Raymond Chen blogged about the internals of InterlockedIncrement and InterlockedCompareExchange. According to this discussion on Stack Overflow, we should make a distinction between race conditions and data races. This blog post defines the terms and gives a neat example where the code is modified to exhibit zero, one or both behaviours. In both cases, use of a synchronisation object across all the threads involved (e.g. 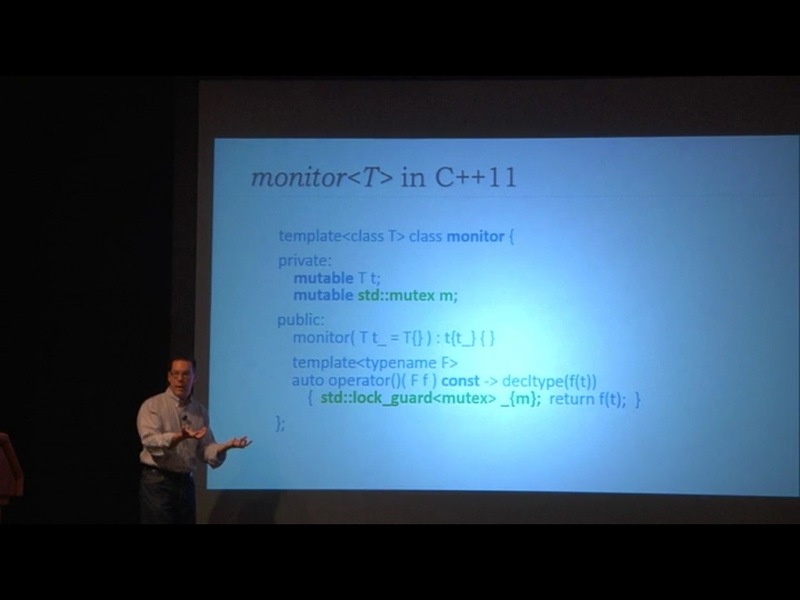 a mutex) would address the issue. 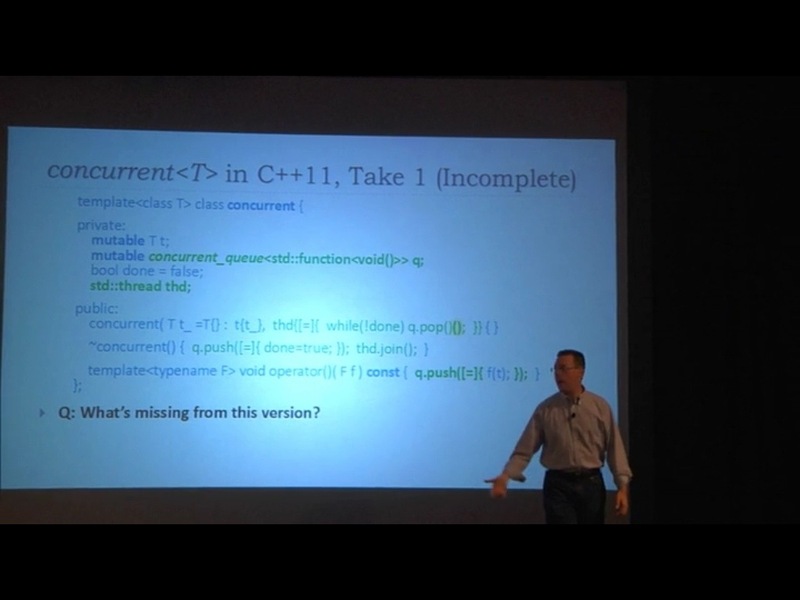 Interesting post from Jens Weller on the new concurrency features in C++ 11 and C++ 14. He gives examples of code written using standard library async, futures and “.then()” with lamdbas, compared to the simplicity of expressing the same functionality with the proposed resumable functions (that is, resumable and await as language keywords). Whilst resumable and await won’t be part of the language until at least C++17, Weller points out that Microsoft may put implementations into Visual Studio well before that. Here’s the paper, N3722. This is a famous paper on concurrency and the benefits of functional programming. It’s obviously no coincidence that I’ve heard of the author in connection with F#. From looking only at their types we can see that f is a pure function: it has no side effects. In contrast, g has side effects, and this is apparent in its type. Each time g is performed it may give a different result. Since there are no programmer-visible locks, the questions of which locks to take, and in which order, simply do not arise. In particular, blocking (retry) and choice (orElse), which are fundamentally non-modular when expressed using locks, are fully modular in STM. 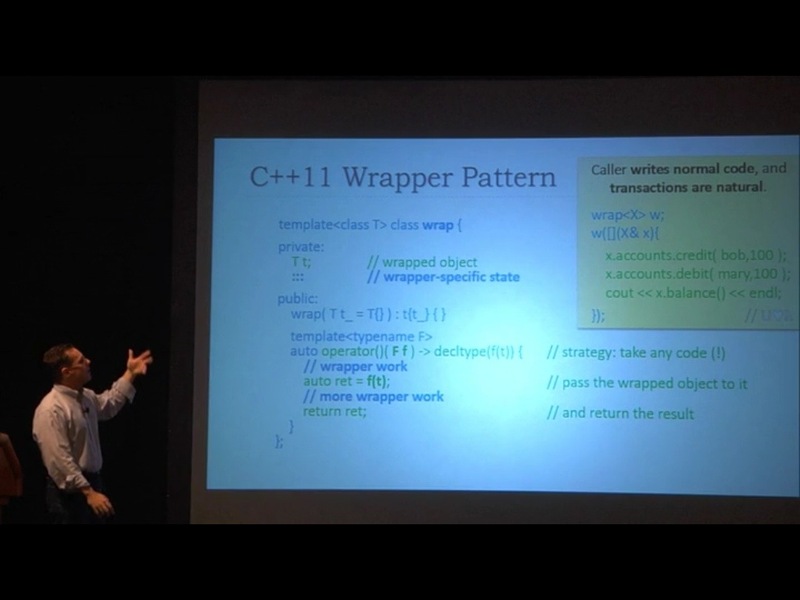 Marius Bancila wrote a neat introduction to C++11 concurrency. Now that we’ve got SynchronizedQueue<T> and Sequential<T>, here’s Concurrent<T> which provides a way to perform a series of synchronised operations on some object in parallel with the activity on the main thread. For example, if you need to keep a GUI thread responsive. I love the idea of pushing a “Done” event onto the message queue in the destructor so that queued work is concluded and then Concurrent<T> returns. This is also a very nice use for std::future and std::promise – allow the caller to keep the return value as a future, but don’t block until it’s needed. // because then the caller would have to block.